Maui Babe browning lotion is made from an old Hawaiian secret formula, mixed from natural Hawaiian ingredients, including Aloe. Maui Babe Browning lotion will give you a dark tan without spending hours in the sun. This lotion will leave you will great soft, smooth skin. I actually bought this lotion while vacationing in Hawaii a while back. I like to try products made in its country of origin. I asked around and this was the lotion that was recommended for a fast, dark tan. So if you don’t want to spend numerous hours trying to get the perfect tan this could be for you. I couldn’t believe how quickly my skin tanned with Maui Babe. For those of you not vacationing in Hawaii, you can order it online. It is a bit expensive but well worth the money. Maui Babe Browning Lotion comes in 8 oz. bottle with a yellow label with the product name and ingredients listed on the front. It’s not an attractive bottle at all but the product itself is amazing. As they say, don’t judge a book by its cover you wouldn’t want to miss this one. If you’re prone to burning I do suggest applying a sunscreen first, wait ten minutes and then apply Maui Babe Browning lotion as it does not contain any SPF. I haven’t found a tanning lotion that has enabled me to tan this quickly. The lotion is also water resistant but if you go swimming and you are in the water for more than twenty minutes you should reapply the Maui Babe again. 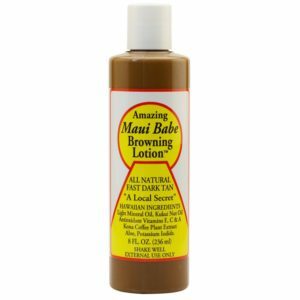 Maui Babe Browning lotion brown in color but it is not a self-tanning lotion or a bronzer but it can stain clothes. It is greasy and you have to rub it in until the brown streaks are gone. One thing I find with this lotion aside from the fast, beautiful tan I get is how soft my skin feels. You will also notice that once you put this lotion on and you’re out in the sun, you won’t feel like you’re burning at all. What you will notice is the beautiful tan in a very short time. You can tan in as little as fifteen minutes with this lotion while wearing sunscreen as well and that is a record even for me. You can use Maui Babe on your face but it is a bit greasy. I normally do use it on my face but just a small amount and it does the trick. The first time I used Maui Babe Browning I noticed it had a strong dark chocolate scent with a very faint hint of coffee, my two favorite things! Some people may be put off because it’s a really sweet scent but it fades after a while once you apply it. I didn’t mind the scent at all. All in all, this is my ultimate super tanning lotion. I would rate it a 5 out of 5 for tanning results but an overall 4 out of 10 because it takes longer to apply before the streaks disappear and it is greasy. I still recommend Maui Babe Browning Lotion to all of my friends and family.